For those of us who resolved to eat healthier in 2015, here is a recipe that looks interesting, tastes good, is inexpensive to make, doesn’t take much time to prepare and is good for you. The recipe is courtesy of What’s Cooking, a program of the United States Department of Agriculture. 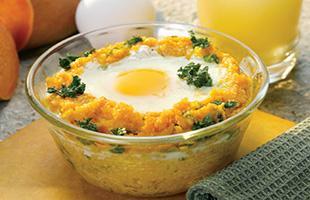 A modern twist on a Southern classic, this recipe for a baked breakfast dish features eggs and grits with sweet potatoes and kale. 2. Coat 4 individual soufflé dishes with 1 tsp vegetable oil. 3. Make 3-4 slits in sweet potatoes; cook in microwave until just soft. 4. When sweet potatoes are cool enough to handle, peel, cut into chunks, and puree in food processor. 5. Heat remaining vegetable oil in sauce pan, and sauté kale about 5 minutes. 6. In a medium sauce pan, boil water and milk, add grits and sweet potatoes; cook for 5 minutes. Remove from heat; stir in sauteéd kale. 7. Divide grits mixture evenly among 4 soufflé dishes (or place all in casserole dish). 8. Make 4 depressions in the grits mixture with the back of a large spoon. Carefully break one egg into each hollow. 9. Bake uncovered for 30 minutes until eggs are cooked. Let cool 10 minutes before serving.